Kanye West may be an awful person—but he’s also a contemporary artist on a par with those celebrated by curators and museums worldwide, Mo Salemy writes. Kanye West is a contemporary artist on a par with those who are celebrated by curators and art institutions worldwide, Mo Salemy writes. Photo: via Run the Trap and EDMHUB. Like Donald Trump, with whom he is currently sharing the media space, Kanye West is an awful person. They are both personal boosters, constantly spewing self-admiration. They also like to make baseless accusations against respected people. Similarly, in recent days, West directed his humiliating invective—and, admittedly, some cute mouse emojis—against Canadian EDM star Deadmau5 when the latter called West out for participating in illegal downloading on Pirate Bay. “Do you do birthday parties?? My daughter loves Minnie mouse…” Kanye tweeted back as part of his rant, making fun of Deadmau5’s iconic performance headgear. But bluster is not the only thing West shares with Trump. He also has some of Trump’s political ambitions, suggesting several times in the past and most recently in “Facts,” a track from The Life of Pablo, that he might be running for president in 2020. More importantly, West and Trump are both classic misogynists, literally and metaphorically. They are never short of ways in which their greatness relates to women in an unpleasant and derogatory way. But drawing similarities between the United States’s top bad boy and its chief right-wing demagogue must stop here if we aim to evaluate West’s contributions to culture as an African American contemporary artist on par with—or even more significant than—those who are celebrated by curators and art institutions worldwide. After all, sexism and misogyny have not prevented Jeff Koons and Richard Prince, or even accused wife killers like Carl Andre, from being highly recognized for their art. And as far as the world of pop music is concerned, few have asked Sting why he wrote “Every Breath You Take,” which can easily be characterized today as the stalking anthem. Nor have thousands taken to social media to criticize the sexual politics of pop songs such as Paul McCartney’s “Temporary Secretary,” which uncomfortably blends the logic of workplace sexual harassment with the precarious essence of neoliberal office temp work. One might also reason that hip hop and rap, the genres to which West’s music belongs, are known for their sexism and misogyny, and that West’s creations are not exceptional, but rather “genre specific,” in that context. As to why I think we ought to talk more about West’s new album, even though every major media outlet, music blog and YouTube personality has already previewed and reviewed the album: Because those who have already spoken about The Life of Pablo are unfortunately not pointing to the most crucial issues that the album as a work of art—not just an item of material pop culture—raises. Also largely unexamined thus far are the legacies West continues to leave for African American life and early 21st-century history. If, as West recently declared on Twitter, he is not a rapper, then to what genre of musicians or artists does he belong, given the post-scarcity and “athleticist” logic with which he carries out his over-production of culture? Can West—some might say, in spite of his age—be considered an emerging contemporary artist? Could he even, within this vast and indeterminate field of art activity, be placed alongside younger white colleagues from Europe and North America who have been associated with the post-Internet movement and Dis Magazine? Besides, shouldn’t the diversity of West’s “practice” remind us of those artists who owe their careers to the re-imagination of art as an intersection of music, design, fashion, technology and marketing? 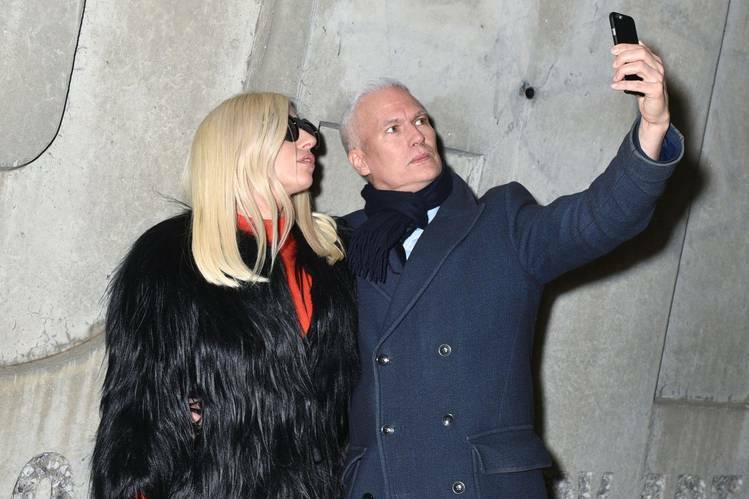 Certainly PS1’s selfie-addict curator Klaus Biesenbach seems to be a proponent of this model, snapping pics with Lady Gaga and James Franco with nary a second thought. Biesenbach also supports artists whose fast-blossoming careers consist of this strategy, such as Iranian American artist Babak Radboy, who actually has worked on West videos in the past. Admittedly, West has gained a foothold—and more—in the official contemporary-art realm of late. In May, he was awarded an honorary doctorate by the School of the Art Institute of Chicago. In July, a film for his songs “All Day/I Feel Like That,” directed by Steve McQueen, debuted at LACMA. And prior to that West collaborated with Takashi Murakami on his “Good Morning” video and with George Condo, who did the cover for My Beautiful Dark Twisted Fantasy. But in my opinion, West’s work not only belongs to the category of contemporary art, but can also stand up to contemporary art’s highest echelons of practice. The rigorous manner in which he walks the talk of recent contemporary art trends sets his work apart from countless “new works” one might encounter at any given art fair, biennial or museum these days. Not content with his award-studded music career (remember his 21 Grammys? ), West has pushed the limits of experimentation. This has magically raised his profile in contradictory directions of avant-garde and kitsch, high and not-so-low culture. Tracing West’s cultural status entails remembering how his productions experienced a qualitative shift around the time of his marriage to celebrity Kim Kardashian, the unveiling of his famous Yeezy 2 Red October sneakers for Nike and the release of his previous album Yeezus, whose track “Bound 2” foreshadows the alien-gospel-soul trajectory of The Life of Pablo. The unbearably violent synths and the intensity of West’s screaming proclamations about being God in Yeezus come across both as a break with the perfectionist maximalism of his previous works and as an embrace of the architectural minimalism that he enacts in the highly curated space of The Life of Pablo. Does it really matter that the petition to name West as the director of the 56th Venice Biennale did not succeed, given the massive amount of aesthetic and organizational labour he has dedicated to his Life of Pablo project? West’s new album is ripe with diversity both in terms of the artists and producers it gathers into a single cohesive project and the histories and futures of black music it archives in one recording. Led by West, the long list of this album’s African American collaborators includes artists such as Chance the Rapper, Rihanna, Frank Ocean, Kelly Price, The-Dream, Kendrick Lamar, Kid Cudi, The Weeknd, Ty Dolla $ign, Chris Brown and Kirk Franklin, and producers including Mike Dean, Rick Rubin, Metro Boomin, Southside, Hudson Mohawke and Swizz Beatz. These various artists’ contributions, together with West’s mastery of cut-and-paste sampling, all formalized through his flawless musical arrangements, are organized to give listeners a new sense of time. Listening to The Life of Pablo is not unlike entering a quantum time machine: one in which the relationships between gospel, soul, disco, hip-hop and electronic music—basically the past, present and future of black music—are not chronological, but simultaneous. One way to think about music is as a flow of data, which reveals its totality only in the anthropocentric category of time. Another way is to characterize music along other human-made physical flows, which are sustained for longer than it takes to listen to a song or an album—fluctuations which, if continued long enough, join the surrounding world as concrete infrastructure. However, the sonic qualities of The Life of Pablo are such that one might not need this theoretical meandering to understand why music is always already nothing but an architectural space. There is a concrete spatial metaphor that can best capture The Life of Pablo’s dark, dusty and industrial—yet, at the same time, human—space. The surface qualities this space offers, and the movements it accommodates or prohibits, can be best described if we travel to a former East Berlin power station on Berliner Allee in the German capital. For the last decade, this station has been repurposed as one of the world’s greatest nightclubs: the Berghain. But unlike the Berghain, which is notorious for its hyper-strict door policy, The Life of Pablo has been offered for free on the artist-initiated music platform Tidal. There, it is embraced equally by those who are professionally involved with music and masses of youth, black and not, who have been listening to and struck by its invisible beauty. On YouTube, one can also find many instrumental versions of West’s tracks, some made from scratch using the exact samples and equipment; these bypass the Tidal platform’s copyright policy and expand the album’s aesthetics beyond the possibilities of market capitalism. This new album contains West’s latest explorations of electronic music’s horizons—especially if listeners divorce it from certain hip-hop genre associations and instead perceive it as a one giant instrumental piece of music in which the human voice (including that of West himself) is shape-shifting sound equipment. These moments of discovery in the album are obviously amplified, usually in the beginning and end of most songs, but also in the middle of verses and spoken words where auto-tune technology truly reveals the inhuman nature of West’s musical project. As perhaps the first music album offered exclusively on a cloud-based streaming basis, The Life of Pablo has undergone slight modifications to its recording since its release on February 9; West has changed track listings and readjusted the mix on several tracks. Together, these innovations add not only to the notion of West’s authentic practice as an artist; they also amplify the kind of transformations the music industry (if not art-making in general) will experience in our unfolding century. Before we close the case on Kanye West’s ontology as an African American contemporary artist, we ought to locate The Life of Pablo’s politics beyond the social issues which so far have framed the discussions of African American culture in the past decade. In this context, West’s track “Real Friends” features an original and blunt discussion of how class mobility has negatively transformed the artist’s relationship to his community. The lyrical progression in this track slowly but surely challenges the usual presumptions found in most, if not all, mainstream cultural productions by African American artists about the continuity between personal success and community emancipation. We learn in the song about West’s reluctance to identify with “where he comes from,” and that his cousin sold the artist’s laptop containing graphic pictures of his “amorous affairs” back to him for $250,000. If we reverse the subject position and re-read the “Real Friends” story from the cousin’s point of view, we can see how The Life of Pablo’s politics consist of a complicated picture of the Mobius-like way race and class intersect in the spectacle of African American celebrity life. This recording’s image of a dead and disappeared successful artist erased from his family and community challenges the happy endings offered by the black-power gestures of the hot-sauce-carrying Beyoncé, or the moral obligations of representing injustices performed by Kendrick Lamar in his music. Knowingly or not, West’s The Life of Pablo, and more explicitly the song “Real Friends,” question the outdated technology of identity politics. It’s notable that these same politics around identity propelled Barack Obama’s presidency, which has mostly failed to deliver on its promises of black emancipation beyond political representation. Perhaps West’s blunt, counterintuitive attitude towards the complexity of the African American identity is why so many people have a hard time with his image and what it represents. Yet if there’s anything we know from the history of art—and its contemporary practice—it’s that art should complicate the easy consumption of images and other cultural products, and it should make people think about representation. Any way you look at it, Kanye West is an artist—whether his attitude about that, and so many other things, is unpalatable or not. Mohammad Salemy is an independent New York-based artist, critic and curator. He has shown his works at Ashkal Alwan in Beirut and Witte de With in Rotterdam. His writings have been published in e-flux, Flash Art, Third Rail Quarterly, and the Brooklyn Rail. Salemy has curated exhibitions at Vancouver’s Morris and Helen Belkin Art Gallery, Access Gallery and Satellite Gallery. He holds an MA in critical curatorial studies from the University of British Columbia and is one of the organizers of the New Centre for Research & Practice.